There is no level playing field in audio-visual advertising for video sharing platforms (VSPs) on the one hand and audio-visual media services providers on the other. Whereas they fulfill different functions for advertisers and agencies, they compete for the same budgets – but not on equal terms. This is the outcome of a study by the Centre on Regulation in Europe (CERRE), which was presented and discussed at their executive seminar on 3 April. 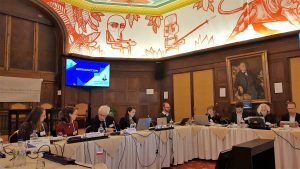 EACA participated as discussant together with representatives from the European Advertising Standards Alliance (EASA), the Association of Television and Radio Sales Houses (egta), national regulators, broadcasters and others. They addressed issues, ranging from self- and co-regulation, to transparency on money flows, access to and use of data, as well as metrics.